A while ago I published a post called Moisturizer Myths which explained, among other things, the fact that a moisturizer will not get rid of your wrinkles. Now that I have published that post I decided that it would be helpful to explain how to find the right moisturizer for your skin type. Right off the bat I want to state that it is actually relatively easy to find a good moisturizer without breaking the bank. The keys to finding the right moisturizer for your skin is to figure out which formulation is best for you and to find the right ingredients that will benefit your skin the most. Moisturizers are like aspirin: minimiracles that we take for granted. While they won’t have an effect on wrinkles per se, they do help protect skin from dryness, chapping, and weathering, and keep it smooth, soft, and healthy. And a good moisturizer will do more for you than drinking twenty glasses of water per day. Drinking water does not necessarily make skin moist. If you’re truly dehydrated your skin can turn dull and peaked, but it’s the moisturizer applied directly to the skin that will keep water from evaporating and give your skin a healthy, dewy appearance. …It’s important to note that even though moisturizers won’t necessarily affect how the skin functions at the cellular level (that is, they won’t change the production level of collagen and repair of tissue damage), they are an excellent way to keep the skin hydrated, replenishing the natural moisture elements in the upper layers and bolstering the barrier function of the skin. Yes, that smooth, dewy appearance is temporary but if you moisturize frequently you keep that glow turned on. 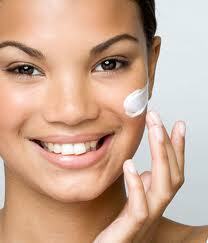 If your skin is dry: look for a cream or lotion moisturizer that is oil based. A rich, creamy formulation is perfect for your skin. If your skin is oily or acne-prone: if your skin is feeling tight you can definitely moisturize oily and/or acne-prone skin. Look for light-weight lotions, gels, serums, or even hydrating mists that are water-based. Make sure the formulation is oil-free and says either “won’t clog pores” or “non-comedogenic” on the label. If you have sensitive skin: look for a water-based lotions and creams that are labeled “fragrance-free”, “for sensitive skin”, or even “hypoallergenic”. Try to get a moisturizer that doesn’t contain a ton of ingredients. No matter what your skin type your moisturizer should contain antioxidants. The number of antioxidants out there is becoming mind-boggling, and I truly don’t believe that one is better than another. What is important is to apply antioxidants to your skin either in your moisturizer or in an antioxidant serum or both. All moisturizers contain two types of hydrating ingredients: humectants and emollients. Humectants attract water to our skin while emollients seal moisture in our skin by forming a protective barrier. Emollients act as a lubricant on the surface of the skin keeping the skin soft and smooth. Humectants increase water content in the skin stopping the evaporation of water from the surface of the skin; they can feel more heavy and greasy. Ceramides are lipids naturally found in the skin’s top layer of the epidermis, alongside other fats such as cholesterol and fatty acids. Their chief role is to keep moisturize in the skin, and they have been used to treat eczema, as studies show that people with eczema have significantly fewer ceramides in their skin. Collagen can help give the illusion of smoothness, but don’t be fooled into thinking that rubbing a collagen-containing moisturizer on your face will suddenly help your skin’s natural collagen. Large collagen molecules cannot penetrate the skin’s deep layers, so they remain on the surface and do not have an effect on how the skin performs. There are tons of good moisturizers out there. Finding the right one is just a matter of personal preference and budget. Some of my favorite moisturizers come from Skinceuticals, PCA Skin, Dermalogica, and Glotherapeutics. Some good budget buys are Neutrogena, Aveeno, and Eucerin. But really that is just scratching the surface of what is out there. For even more recommendations see Paula Begoun’s Beautypedia or read The Skin Type Solution by Dr. Leslie Baumann. Does Your Daytime Moisturizer Have to Have Sunscreen In It? Anyone who reads this blog with any consistency knows that I am a sunscreen fanatic so my answer to the above question my surprise you. I actually don’t think that your daytime moisturizer needs to have a sunscreen in it. I always want everyone to have a separate facial sunscreen that it at least spf 30. I believe this for a few reasons. First off, I am never convinced that people use enough of their moisturizer in the morning to actually get adequate sun protection. As the seasons change and the weather gets warmer many people don’t need to use moisturizer as much and this is exactly when you need that facial sun protection more than ever. If you are going to apply too much a one thing to your face let that be sunscreen. You probably won’t want to reapply your moisturizer throughout the day, but you’ll need to reapply your sunscreen. For those reasons I always advise people to have a separate moisturizer and sunscreen. Also if your moisturizer doesn’t have sunscreen in it you can use the same one morning and night. So in case you were wondering – no you don’t need a different morning and evening moisturizer. If you want both a daytime and nighttime moisturizer go for it, but it isn’t a necessity. If you still want to get a daytime moisturizer with sunscreen be sure the moisturizer has at least spf 30 and is a broad spectrum sunscreen which means it protects you from both UVA and UVB rays. The Skin Type Solution by Leslie Baumann, M.D. What about when a moisturizer has vitamins AND some form of mineral oil in it? Do the vitamins reach your skin? Do the vitamins have to be very close to the top of the ingredient list to be effective or are they still effetive even if they are towards the end of the ingredient list? Thanks! Generally you want the ingredients that are going to do the “work” in a product to be in the top third of the ingredient list for a product. See my post: How to Read a Skincare Product Label for more information.